What people are saying about our programs! Tommie came to us a boisterous pit bull mix in need of some manners. Her zest for life was apparent, and sometimes a bit much, as she would leap on people to greet them, and occasionally be a bit too forward with new dogs. After our Amazing Dog program she was a whole new pup! "I love these trainers almost as much as I love my pup! Before we went to them my dog Tommie was on her own agenda all the time. I had to drag her on walks, she'd jump on every person that passed by, and would sometimes play too rough for the other dogs at the park. Tommie now enjoys life in busy Chicago, going to eat at outdoor patios in summer, and enjoying off leash play time in the park. She politely greets guests and neighbors without leaping on them. Boo is a chihuahua mix who lives in the bustling Hyde Park neighborhood. Boo had moved from a smaller town to the big city, and was having some trouble minding her manners on leash with all the distractions! Despite her small stature she pulled like a freight train, and was often barking at other dogs, squirrels, birds, and any other animal who could hear her. After a customized private lesson package Boo is walking much better, and is known as a good canine citizen around the neighborhood. Grizzly is a longtime member of our Sunday agility crew! Grizzly joined agility looking for a fun environment to play with her owner in. Grizzly lacked a lot of the confidence necessary to loosen up and just have some fun. 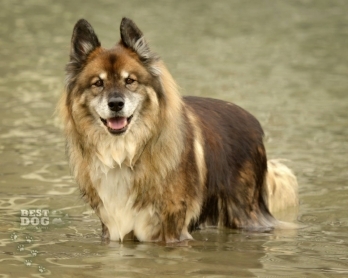 Agility helped Grizzly gain the confidence she needed, and bond with her owner through play. It is such a joy to see how confident Grizzly has grown, and to see her and her owner play like they never have before! Moxie is a super fun Border Collie from the West Loop. Moxie had an overwhelming amount of energy, which seeped out, in the form of barking, at everything while she was on leash. 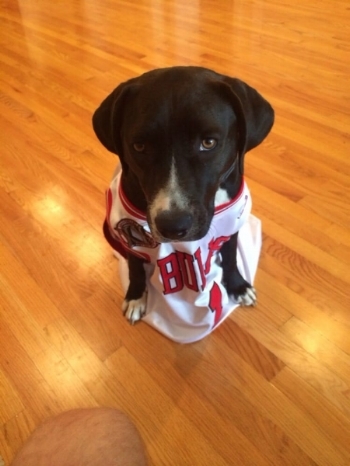 Moxie can now cruise the West Loop and Skinner Park without woofing her hellos. Sam was a very rambunctious, hyperactive adolescent pup, who had been recently adopted. His chewing, leash pulling, and lack of manners was driving his new family nuts! "Emily is amazing! She took my hyper, shoe eating, jumping all over the place, bundle of a puppy and turned him into a respectable member of the family. I'm sure it wasn't easy. We have a busy household with 3 children between the ages of 5 and 10. So there were all kinds of distractions. Part of what makes Emily so amazing is that she customized our training to include helping us set up our home in a way that helped our dog make the right choices. She also tailored our training to include another session at home that integrated my kids and teaching them how to handle their new best friend. Sam is now a respectable member of his family, and has a blast with his three kids! He enjoys freedom he never had before, now that he will come when called, and behave appropriately in the house. Bert and Blanche are a pair of troublemaking Golden Retrievers from Lincoln Park. They're cute and they know it, and use this to sneak food off the counters, beg at the table, drag their owners down the street to jump on passersby, and say a very happy hello to each dog they meet. They would tag team, so one could sneak off and cause trouble, while the other provided a fluffy distraction!